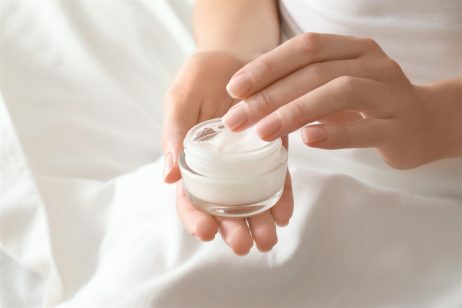 Stearic acid is a saturated fatty acid with an 18 carbon chain that is used in a variety of cosmetics and personal care products, as a fragrance ingredient, surfactant, and emulsifier. Stearic acid, also known as octadecanoic acid, can be derived from both animal and vegetable fats and oils. However, fats and oils rich in stearic acid are more abundant in animal fat (up to 30%) than in vegetable fat (typically less than 5%). The important exceptions are cocoa butter and shea butter, where the stearic acid content (as a triglyceride) is 28 to 45%. Stearic acid is obtained from fats and oils by the saponification of the triglycerides using hot water (about 100 °C). The resulting mixture is then distilled. Commercial stearic acid is often a mixture of stearic and palmitic acids, although purified stearic acid is available. Stearic acid functions mainly as a surfactant, emulsifier, and thickener when added to cosmetics and personal care products. Surfactant is the short term for surface active agent. Surfactants are compounds that lower the surface tension between two substances, such as two liquids or a liquid and a solid. A perfect example to explain this concept is when rain falls on a window. The reason why distinct droplets form and the glass doesn’t get wet uniformly is due to surface tension. This same phenomenon occurs when you wash your face or take a shower. Water molecules prefer their own company so they tend to stick together in drops. In order to make water wash more efficiently, surfactants were created. Surfactants reduce surface tension so that water wets things more uniformly. Another job of surfactants is to degrease and emulsify oils and fats and suspend soil, allowing them to be washed away. This is possible because while one end of the surfactant molecule is attracted to water, the other end is attracted to oil. Thus, surfactants attract the oil, dirt, and other impurities that have accumulated on your skin during the day and wash them away. Due to these properties, stearic acid can be found in many different cleansers and body washes. Stearic acid also acts as an emulsifier. An emulsifier is needed for products that contain both water and oil components. According to EFEMA, when water and oil are mixed together and vigorously shaken, a dispersion of oil droplets in water – and vice versa – is formed. When shaking stops, however, the two phases start to separate. To address this problem, an emulsifier can be added to the system, which helps the droplets remain dispersed and produces a stable emulsion. As an emulsifier, stearic acid consists of a water-loving hydrophilic head and an oil-loving hydrophobic tail. The hydrophilic head is directed to the aqueous phase and the hydrophobic tail to the oil phase. Once again, stearic acid reduces the surface tension by positioning itself at the oil/water or air/water interface, which has a stabilizing effect on the emulsion. Another property of stearic acid is its ability to function as a thickener or hardener. This is why stearic acid is added to things like soaps, candles, plastics, oil pastels, etc. It helps to harden the product and also helps to retain its shape. In addition to functioning as a surfactant to help wash away excess oil and dirt from the skin, stearic acid also acts as an emollient. According to skin care expert Paula Begoun, stearic acid has been shown to protect skin’s surface against water loss and help shore up skin’s protective barrier. The Food and Drug Administration (FDA) includes stearic acid on its list of direct food additives considered Generally Recognized As Safe (GRAS). 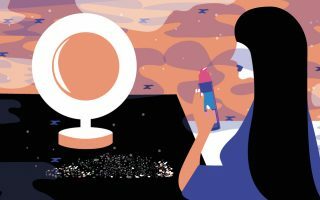 The Cosmetic Ingredient Review (CIR) Expert Panel evaluated the scientific data and concluded that stearic acid is safe for use in cosmetic products.